Lebanese firefighters extinguish burning cars at the scene of an explosion in the mostly Christian neighborhood of Achrafiyeh, Beirut. A LOUD EXPLOSION has been heard in Lebanon’s capital with black smoke rising from the eastern part of Beirut. The circumstance of the blast were not immediately clear but Lebanon has seen a rise in clashes and tensions in recent months stemming from the civil war in neighbouring Syria between Sunni insurgents and President Bashar al-Assad. Reuters reported that ambulances rushed to the scene in the Ashafriyeh district, a mostly Christian area but police did not confirm casualties. However local media have reported two fatalities and 15 people wounded in the explosion which they claim was a car bomb. Lebanese TV channel MTV reported that the explosion took place about 200 meters from a Kataeb headquarters in the area and at least seven cars were set ablaze as a result of the blast. Image from Lebanese news channel MTV of casualty of the blast. 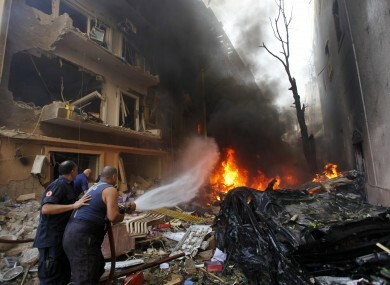 Email “Two killed as large explosion rattles Beirut”. Feedback on “Two killed as large explosion rattles Beirut”.